We arrive at the Haifa court building around 11am, half an hour after proceedings began in the ongoing trial of Ameer Makhoul, a leading Palestinian activist who holds Israeli citizenship and was arrested in his home in the middle of the night last May. After being held without charge, tortured and denied access to an attorney for three weeks, the State of Israel accused Ameer of trumped-up charges of espionage. As it frequently does in “security cases,” the Israeli government based its accusation on “secret evidence” that Ameer and his legal defense had no access to. It became clear that Ameer’s arrest and the charges against him was an attempt to scare Palestinian citizens of Israel into submission. Ameer has stood for court dates almost monthly since being arrested, and little progress has been made. There has been talk of a plea bargain, but no judge has read a sentence and his trial has become a monthly meeting of his nearest and dearest, testifying to his commendable character and good standing in the community. Today’s hearing was supposed to begin at 9am but was pushed back. The room — even though there is a horde of people outside waiting to get in — has only two benches for spectators. There are empty courtrooms with five or six benches, enough to easily accommodate all interested parties. But instead we’re outside the door, while two, sometimes three, behemoth security guards control the door and glare at us intimidatingly. Milling around is a veritable who’s who of Haifa politics and activism. A Jewish member of the Communist party who is on city council comes out after giving testimony and hobnobs with influential activists, former Members of Knesset, employees of various nongovernmental organizations in Haifa, international activists, journalists, powerful lawyers and friends and family of Ameer. It’s a bit unnerving to realize that if they wanted, Israeli intelligence agents could show up outside this courtroom, arrest everyone standing there, and essentially silence all dissent in Haifa. All the major players in one place, for one cause. As two people come out, two are let in. One comes out, one goes in. Then two come out, and the ogres at the door decide no one else is allowed in. Some among us start arguing with them, calling them out on their arbitrary change of policy, but they’re enjoying their show of strength too much. They tell us to move over; we have to wait from the side, for no apparent reason. They bring in those extendable line-makers, like those found in movie theaters and airports, and create a space where they can stand with their arms crossed, surveying their prey, a space we’re not allowed to enter. There is an easy parallel between this charade and the political situation here; we are told where we can stand, what we can do, and whether or not we are allowed in. And just like that, it’s over. People come flooding out; greeting and kissing each other on the cheek, saying hello to friends and family and colleagues. Ameer’s wife and daughters come out into the crowd, so do his sisters and his brother, observers from European embassies, community members, then the lawyers. Some of the best lawyers in Israel were there, and still, this trial continues. It’s court date after court date of unanimously supportive character witness testimony. The prosecution has no evidence to present, at least not in a public hearing; such is the nature of these “security cases.” There was supposed to be a decision on his sentence today, but there wasn’t, and there will be yet another court date in January with more and more character witnesses, more and more people testifying in support of Ameer Makhoul. But there is irony in this; the longer they can postpone sentencing him, the longer he stays in jail, unable to kiss his wife, or hug his daughters. We can spend years and years giving positive testimony in support of Ameer but if he is not sentenced, he stays in jail, perpetually on trial. When his younger daughter came out of the courtroom, I read her eyes. She is brave, so brave. I cannot imagine going through what she is enduring. Month after month she comes to these trials, sees the community supporting her father, perhaps once in a blue moon she can hold his hand. His sister was allowed to hug and kiss him for the first time today, but when Ameer’s wife visits him in prison they are permitted only to communicate through a telephone and a glass barrier. He is perpetually sealed off from his family. His daughter floats through the crowd, puts on a smile, hugs her aunts and uncles and shakes hands with her father’s colleagues. When they look away, her face falls, and her eyes are sad, almost empty, resigned in a way to his fate. She has gone through too much for an adolescent girl. Still she, and Ameer’s entire family, and the entire community, tirelessly fight for his rights. But with each farcical trial date, perpetuating this charade of “justice,” it seems less and less likely that these rights will ever be realized, a decision will be made, and he will be released, able to join his family at their home once again. Audrey Farber is a writer, activist, photographer and brain-for-hire who most recently interned at Mada al-Carmel – Arab Center for Applied Social Research, in Haifa. 131 anti war protesters arrested in DC. Whether you agree or disagree with the wars in Iraq and Afghanistan, an anti war demonstration in front of the White House where 131 people are arrested is very probably national news. Among those arrested were Ray McGovern, a former CIA analyst who used to provide the president’s daily briefings, Daniel Ellsberg, who released the government’s Pentagon Papers during the Nixon administration, and Chris Hedges, former war correspondent for the New York Times. In any normal country, this would be at least a blurb, a short mention on a nightly newscast. But in our “democracy”, there is nary a mention of this, er, non-event. Nary a mention implies some kind of a mention, even in passing. There is no mention of this event on any American media. It is almost like the media and the government elites are cooperating. Use google news to search for this story, use “veterans DC protest” as the keywords and only use the “news” search option. Do you see any NBC, CNN, ABC, FOX stations? Local papers, blogs, even AOL News (these exist!?). Eagle Tribune, Brad Blog (blog), Socialist Worker Online, GC Advocate. That is it – a grand total of 4 entries, and no CNN. Goto the google news tab and make up your own searches. Make sure to use veterans and protest and then put your mainstream TV conglomerate(s) and/or newspaper(s). Then make sure to turn on your TV, preferably onto a cable news channel, and see what they consider news. A heap of ruins and dust is all that remains of a dairy that Israeli warplanes destroyed yesterday in the central Gaza Strip city of Khan Younis. The ruins of the dairy are adjacent to an amusement park in the Asdaa grounds which serves as a refuge to residents of the besieged Gaza Strip. Adjacent to the amusement park in the Asdaa grounds in the central Gaza Strip city of Khan Younis stands a heap of ruins and dust. It is all that remains of a dairy that Israeli warplanes destroyed yesterday. Before the bombing, the dairy had three production lines on 400 square meters. It produced milk, cheese and butter, providing income for forty Palestinian families in Gaza and distributing goods to various parts of the Gaza Strip. At dawn, the dairy was hit by at least two jet-fired missiles, scattering machines and equipment several meters away and rendering the factory into a pile of rubble. The attack on the dairy comes amidst increased Israeli military activity across the Strip. Israeli warplanes also hit other targets on Tuesday, injuring four Palestinians, including a guardsman in Asdaa. Standing amidst the rubble, al-Batsh described how the Asdaa dairy used to distribute its products across Gaza and the impact of the attack on the local economy, already straining under Israel’s 42-month-long siege. “Our financial losses from this attack are estimated at about $300,000. Besides these direct financial losses, there is an indirect loss represented by the people who used to provide us with raw materials, plastic packs and those who used to carry the products in vans and distribute them to grocers in many parts of Gaza. We really wonder as to why such a place was targeted by the Israeli warplanes. It is a dairy and does not manufacture weapons or homemade rockets,” explained al-Batsh. The Asd’a facility was built on the grounds of a former Israeli settlement. In addition to the dairy, it includes an amusement park, a fishery, a turkey pen and a public garden. The public garden features some wild animals, including monkeys, and a small train for children runs through the grounds; the train now passes by the ruins of the dairy. Since the facility was established, it has become an attraction for Gaza’s residents, who relish the opportunity to spend time outdoors in spite of Israel’s crippling siege. Rusaila Hammad is a teacher from a nearby school who brought 120 children to the Asdaa gardens after the attack. “We learned earlier that the Asdaa facility was targeted. However, we in the school administration insisted that we should take the children on the scheduled school trip,” Hammad explained. The atom bomb tests over the Nevada desert are etched in the American consciousness, even though they ended nearly half a century ago. The clouds that looked like gigantic mushrooms rising into the stratosphere remind us of the Cold War-era American-Soviet race to test and manufacture as many nuclear weapons as possible to fight what many felt would be an inevitable nuclear war. Those days are gone. The Cold War is over. Stockpiles of nuclear weapons are shrinking. All-out nuclear war, while still possible, is no longer regarded as inevitable. And testing has ended – in the atmosphere and below the ground. Thus, it is tempting to think of bomb tests as a relic of history, with no current relevance. But the tests ARE relevant. The Comprehensive Test Ban Treaty of 1996, ratified by 153 countries, has still not been endorsed by the U.S. Senate, or other atomic nations. Thus, testing could legally resume at any time. Moreover, research on health hazards of test fallout is far from complete. Some want to close the book on bomb test studies, citing the age of the tests and the difficulty of understanding health risk. But measuring risk is possible, thanks to – of all things – baby teeth. Studying radiation in baby teeth was an unknown technique when U.S. atmospheric nuclear weapons tests started. By the mid-1950s dozens of weapons had been detonated, including hydrogen bombs one thousand times more potent than atomic bombs. The 422 American and Soviet nuclear explosions into the atmosphere during the arms race equaled the yield of 40,000 Hiroshima bombs. Fallout from bomb tests consisted of over 100 radioactive and cancer-causing chemicals, not found in nature. Each chemical affects the body differently. Iodine-131 attacks the thyroid gland, Cesium-137 disperses into all soft tissues, and Strontium-90 attaches to bone and teeth. The mushroom clouds in Nevada moved eastward with prevailing winds across the continent, where fallout re-entered the environment through precipitation. Scientific measurements showed that only 2 or 3 days after a Nevada explosion, fallout from the test could be present in rain or snow throughout the country, even the east coast 2500 miles away. Lab testing of baby teeth confirmed the fears of many, namely, the enormous buildup of fallout in baby teeth. The average Sr-90 level in baby teeth for a St. Louis child born in 1963 was about 50 times higher than that of their counterparts born in 1950. (8) The St. Louis tooth study entered the policy arena when Washington University’s Dr. Eric Reiss presented results to the U.S. Senate. Soon after, President John F. Kennedy signed the Partial Test Ban Treaty. The Washington University tooth study was duplicated in Czechoslovakia, Denmark, Finland, Norway, the United Kingdom, and West Germany. All studies detected the same sharp increase in Sr-90 as bomb testing went on. The St. Louis study also produced good news: five years after the Treaty went into effect, average Sr-90 in the jawbones of stillborn fetuses plunged about 50%. (8) Post-Treaty reductions were so dramatic that the U.S. government discontinued funding for the St. Louis tooth study in 1970, and studies of Sr-90 in bones of children (1971) and adults (1982), leaving the nation with no program measuring radioactivity in human bodies. Talk of fallout causing cancer was common in the bomb test era. A Newsweek article covering the St. Louis tooth study asked “But what about the children who have done their growing while strontium-90 levels were high – are they liable to develop cancer?” (9) The St. Louis study addressed the buildup of fallout in human bodies, but not cancer risk. Government officials were in no hurry to look at the fallout-cancer link, so the topic went unexamined. After decades of asserting fallout levels were too low to cause cancer, the government position changed after the Cold War ended. Federal studies estimated that fallout caused 49,000 Americans to develop thyroid cancer, with few fatalities (10), and about 15,000 Americans died of cancer from fallout. (11) Some believed these figures to be gross underestimates; a blue-ribbon European panel estimated worldwide cancer cases from fallout to be 123,200,000, half of them fatal. (12) But U.S. health officials, not eager to consider mass carnage, stopped studies of fallout in 2002. The St. Louis tooth study, which had been largely forgotten for decades, experienced a rebirth in 2001. Washington University officials were startled to find hundreds of boxes of teeth not used in the study, stored in a remote ammunition bunker. Each tooth is contained in a small enveloped attached to a 3 x 5 card identifying the tooth and its donor. The school transferred the collection of about 85,000 teeth to the Radiation and Public Health Project (RPHP) research group, which was conducting its own study of Sr-90 in baby teeth near nuclear reactors. RPHP officials recognized that these teeth could be used for a study of cancer risk of “Baby Boomers” now in their 40s and 50s. A sample of the 85,000 teeth was used to locate cancer survivors (through current addresses) and those who died of cancer (through official death records). In December 2010, the International Journal of Health Services published findings of the study, i.e. that “Boomers” born 1959-1961 who died of cancer had Sr-90 levels in their teeth more than twice (+122%) greater than those the same age who are alive and healthy. (13) While more research is needed to estimate casualties, it appears likely that the government figure of 15,000 U.S. cancer deaths from fallout is quite low. A long-ago baby tooth study of fallout can be greatly important in shaping current public policy, in several areas. First, it can help explain why 40% of Americans will develop cancer at some point in their life – many with no known risk factor. Second, it suggests that Americans are being harmed from the same substances produced in 104 nuclear power reactors around the country; the RPHP study of 5,000 baby teeth showed links between Sr-90 in baby teeth and child cancer risk near nuclear plants in New York and New Jersey. (14) Finally, the Comprehensive Test Ban Treaty is still not ratified by the U.S. Senate, and findings of higher cancer rates in “Baby Boomers” from bomb testing underlines the need to ban all further tests of nuclear weapons and their usage in warfare. 1. Kulp JL, Eckelmann WR, Schulert AR. Strontium-90 in man. Science 1957;125(3241): 219-27. 2. Leary WE. In 1950s, U.S. Collected Human Tissue to Monitor Atomic Tests. New York Times, June 21, 1995. 3. Pecher C and Pecher J. Radio-calcium and radio-strontium metabolism in pregnant mice. In Proceedings of the Society for Experimental Biology and Medicine. New York: January-April 1941, Volume 46, p. 94. 4. Salisbury HE. Stevenson Calls for World Pact to Curb H-Bomb. New York Times, October 16, 1956. 5. Danger – Strontium 90. Newsweek, November 12, 1956, p. 88. 6. Kalckar HM. An international milk teeth radiation census. Nature 1958;4831:283-4. 7. Wyant WK. Strontium-90 in St. Louis: 50,000 Baby Teeth. The Nation, June 13, 1959, 535-7. 8. Rosenthal HL. Accumulation of environmental 90-Sr in teeth of children. Hanford Radiobiology Symposium, Richland WA, May 5-8, 1969, 163-71. 9. Moment of Tooth. Newsweek, April 25, 1960, p. 70. 10. National Research Council, Committee on Thyroid Screening. Exposure of the American People to Iodine-131 from the Nevada Bomb Tests. National Academy Press: Washington DC, 1999. 11. Eisler P. Fallout likely caused 15,000 deaths. USA Today, February 28, 2002, p. 1. 12. European Committee on Radiation Research. 2003 Recommendations of the ECRR: The Health Effects of Ionising Radiation Exposure for Radiation Protection Purposes. Green Audit: Aberystwyth, Wales, 2003. 13. Mangano JJ and Sherman JD. Elevated in vivo strontium-90 from nuclear weapons test fallout among cancer decedents: a case-control study using deciduous teeth. International Journal of Health Services 2011;41(1):137-58. 14. Mangano JJ. A short latency between radiation exposure from nuclear plants and cancer in young children. International Journal of Health Services 2006;36(1):113-35. Imperial theorizing totally ignores the role of non-economic socio-political power configurations in shaping imperial policy, over and against major economic institutions like Multi-National Corporations, up to and including major military commitments. The role of zionist power configurations and militarist ideologues in shaping US Middle East policy (2000-2010) is a crucial consideration in discussing contemporary imperialism in theory and practice. For example, between 2000-2005 major popular upheavals and mass mobilizations took place, overthrowing incumbent neo-liberal client regimes, calling for the re-nationalization of privatized firms, the renunciation of the foreign debt, radical agrarian reforms and income redistribution. Neo-liberal ideology was totally discredited and US foreign policy was subject to a thorough discredit. Anti-imperialist, if not anti-capitalist ideology held sway among broad sectors of the working, middle and even elements of the political class. If between 2000–2005 Washington ‘lost’ collaborator clients in Argentina, Brazil, Uruguay, Bolivia, Venezuela, Ecuador and faced strong opposition throughout the region, between 2006-2010, Washington retained or regained clients in Panama, Costa Rica, Honduras, Colombia, Peru and Chile. Equally important the center-left regimes stabilized capitalism and blocked any move to reverse privatized firms. They weakened independent class based movements which threatened radical changes. They moved the political-economic spectrum to the ‘center’. 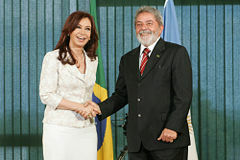 Furthermore, the disarray and retreat of pro-US right-wing parties of the 2000-2005 period was replaced by a recovery and re-groupment in Bolivia, Venezuela and elsewhere. In an ongoing assault on the occupied Gaza Strip, Israeli fighter jets struck the southern city of Rafah early this morning, injuring four. The IMEMC reported that four Palestinians were wounded in the attack, which destroyed an alleged “training base” for the armed wing of the Hamas party (“Army bombards Rafah,” 22 December 2010). Today’s air strikes come after Israeli fighter jets attacked the Gaza Strip early morning yesterday in a coordinated assault on Khan Younis in the south and Beit Lahiya, Beit Hanoun, Jabaliya refugee camp and Zeitoun in the north, according to a report from Al-Jazeera English (“Israeli fighter jets attack Gaza,” 21 December 2010). Ma’an News Agency reported that two Palestinian fighters and one security guard were injured in the missile strike on Khan Younis after Israeli warplanes destroyed a dairy and an entertainment center (“Israeli jets hit Gaza for 2nd time in day,” 21 December 2010). Israeli jets also struck tunnels at the southern border with Egypt. The tunnels are used by Palestinians to bring in essential items, including food, medicine, cement and thousands of other goods from Egypt and the outside world. Israel has imposed a years-long blockade on Gaza, rarely opening the border crossings and maintaining severe restrictions on the movement of people and goods. Hours later, another Israeli warplane struck Khan Younis again, injuring two more in a missile strike. These attacks follow similar Israeli airstrikes on Saturday, 18 December, in which five Palestinian men, all around twenty years old, were targeted by an Israeli missile in Deir al-Balah, according to Ma’an (“Medics recover bodies of 5 killed in Gaza strike,” 19 December 2010). Israel claimed that the five young men were affiliated with an armed resistance group called the Jaljalat, and they were planning to launch a rocket over the boundary with Israel. On Sunday, armed Palestinian resistance groups responded to Saturday’s attacks by firing a series of homemade rocket shells into Israel. The shells landed in the Negev desert, causing no injuries or damage, according to the International Middle East Media Center (IMEMC) (“Eight separate Israeli airstrikes reported throughout Gaza; 2 injured,” 21 December 2010). Additional rocket fire was reported on Monday as well, causing no injuries. On Tuesday, following Israel’s overnight airstrikes, Israeli daily Yedioth Ahronoth (Ynet) reported that a Gaza-fired rocket landed near a kindergarten in a kibbutz near Ashkelon, just north of the boundary with Gaza. A 14-year-old Israeli girl was lightly injured, Ynet reported (“Qassam explodes near kindergarten,” 21 December 2010). “They targeted a dairy and an entertainment center in Gaza … Israel did not target some sort of proclaimed facilities for homemade rockets,” he stated. Almeghari added that Israel’s latest attacks are a “systematic targeting” of the Palestinians inside Gaza in order to weaken the popular support for the elected Hamas government. He added that the failure of the US-brokered peace talks allows Israel to continue attacking Palestinians in the Gaza Strip. By not addressing Israel’s ongoing violations of international law, including the ongoing confiscation of Palestinian land for settlement construction in the West Bank, including East Jerusalem, the international community is culpable for the situation across Palestine, Almeghari said. “Israel only attacks for the sake of attacking, and by squeezing Palestinians in Gaza at the political level to accept Israel’s terms for peace,” Almeghari said. Meanwhile, Israel’s attacks on fishermen, industrial workers and shepherds have continued. As The Electronic Intifada has reported, industrial workers are frequently shot while collecting raw materials near Israel’s so-called “buffer zone” — a 300-meter-long militarized area along the northern, eastern and maritime boundaries. On 10 December, Suhaib M., a 15-year-old Palestinian boy, was shot and injured while he collected wood inside the no-go zone alongside the northern boundary with Israel. Defense for Children International-Palestine Section reported that the boy and his brothers have been collecting raw materials in order to supplement their family’s income for the last five months. Suhaib and his brother Belal were loading pieces of wood from uprooted olive trees into a small cart when he was shot in the leg by an Israeli sniper (“Report: Voices from the Occupation ,” 18 December 2010 [PDF]). Additionally, a man in his thirties was shot in his foot on 20 December by Israeli snipers as he collected stones in the northern Gaza Strip, according to Ma’an. Israeli forces opened fire on the man near the town of Beit Hanoun (“Worker injured in north Gaza,” 20 December 2010). A 19-year-old shepherd, Ijmeian Abu Ihweishel, was shot by Israeli snipers on 19 December as he herded his flock of sheep in the same area, reported Ma’an (“Palestinian teen reported injured in north Gaza,” 19 December 2010). Gaza’s health ministry reported that there have been 103 Palestinians shot by Israeli forces near the no-go zone since March 2010, Ma’an added. Two days earlier, on 17 December, a Palestinian teenager died after being shot on a fishing boat off the southern Gaza coast by Israeli warships permanently stationed in the Mediterranean Sea. Agence-France Presse and Ma’an reported that Israeli forces fired on the small fishing boat, capsizing it and injuring 15-year-old Ziad Samir al-Bardawil, who died after being treated at a local hospital (“Gaza teen dead after Israel fires on fishing boat,” 17 December 2010). In an article following al-Bardawil’s death, the right-wing Israeli daily The Jerusalem Post quoted Israeli military sources who refuted the Ma’an report. The Israeli military said that it “does not recognize the event” and claimed it had nothing to do with the death of the Palestinian boy. Although Israeli government officials have placed emphasis on the so-called “easing” of the blockade, Israel has done little to change the humanitarian situation for Palestinians inside the Gaza Strip, according to a new report signed by 22 major international human rights organizations, including Amnesty International UK, Oxfam International and the International Federation for Human Rights (“Dashed Hopes: Continuation of the Gaza Blockade ,” 30 November 2010 (PDF file)). The report states that the inflow of construction materials, for example, is only at 11 percent of pre-blockade levels, food imports are only at 35 percent and the import of raw materials is still restricted. Additionally, there is a strict ban on exported goods, a policy that has debilitated Gaza’s struggling economy. IMEMC reported that Israel has allowed only the exports of strawberries and carnations from Gaza this week, under the auspices of a Dutch governmental program to assist Gaza’s local farmers (“Israel opens only Kerem Shalom border,” 21 December 2010). Jeremy Hobbs, director of Oxfam International, said in a press release related to the “Dashed Hopes” report that “only a fraction of the aid needed has made it to the civilians trapped in Gaza” (“Six months on: Little sign of improvement in Gaza since Israeli easing of blockade, shows report from aid and human rights groups,” 30 November 2010). The largest Muslim civil liberties advocacy organization in the United States has slammed the US government for using anti-Muslim trainers to teach the police. The Council on American-Islamic Relations (CAIR) has sent a letter to Attorney General Eric Holder, criticizing the US Justice Department for employing anti-Muslim trainers to teach city and state police how to deal with the Muslim community. In his letter, CAIR’s Executive Director Nihad Awad says openly Muslim-bashing groups such as the Center for Security Policy run by neoconservative Islamophobe, Frank Gaffney, have been employed to train state and federal police about Muslims. He argued that using taxpayers’ money to hire such extremist groups, who purposefully misinform those whom they train, must stop. “What is shocking to us is that those who are training the government, those who are informing them about Islam and the Muslim community in the counter-terror area are the ones who see Islam as the enemy, and the Muslim community as the enemy of the United States,” Awad said in an interview with Press TV. He complained that the US government is hiring experts openly contemptuous of the Muslim population, who see them as a suspect community, who are teaching the police that radical Muslims are involved in a “jihad” in the United States to take over the country. The CAIR director rejected the allegations and called on Washington to make sure the information the police are provided with is accurate. The CAIR says it plans to send letters to the departments of Defense and Homeland Security to complain about the Islamophobic practice by the US Department of Justice. GAZA– Senior Hamas official Salah al-Bardawil said WikiLeaks documents of Fatah leaders asking Israel to assault Hamas have prompted the resistance group in Gaza to reconsider talks with Fatah security leaders, and may mobilize judicial action for treason. Bardawil strongly denied that Gaza was jailing anyone for political reasons. “This is a lie aimed at deceiving and creating a media confusion,” he said, adding that facts on the ground say there are no Fatah political prisoners in Gaza prisons. He challenged anyone who had proof of that to come forth. A document that surfaced on WikiLeaks revealed that Fatah asked the head of the Israeli security agency (Shin Bet) Yuval Diskin to attack Hamas in 2007.